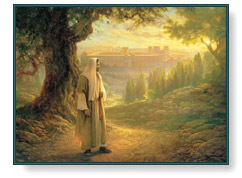 Wherever He Leads Me by Greg Olsen depicts the Lord walking down a winding path with the city of Jerusalem in the distance. This moving portrait of Christ glows with warmth and immediacy. It was inspired by the New Testament Scriptural passage, Matthew 8:19. In it, a scribe said to Jesus, "Master, I will follow thee whithersoever thou goest." Knowing that the path of a true believer is never easy, Jesus cautioned him, "The foxes have holes, and the birds of the air have nests, but the Son of man hath not where to lay his head." Image Size: 14.25" x 19.5"
Print comes framed in an ornate gold frame. Image Size: 22.25" x 30"
Image Size: 46" x 62"
Whereever He Leads Me copyright © 2001 by Greg Olsen and is prohibited from being copied without permission.